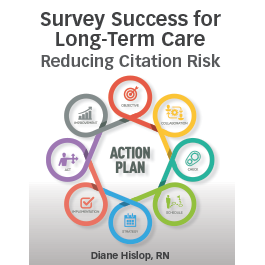 Survey Success for Long-Term Care: Reducing Citation Risk will help long-term care providers develop an effective survey compliance program. The book includes practical, efficient ways to train and educate staff, perform internal audits and monitoring checks, and stay on top of the survey process as it unfolds in your facility, reducing the risk for citations. It also helps identify quality of care indicators and thresholds to determine where potential deficiency areas are. Diane Hislop, RN, is the senior partner and chief operating officer of H2 Healthcare, LLC. Her practice area is clinical and compliance consulting, including legal support, administrative appeals, and forensic nursing.Hislop has over 30 years of clinical, executive, and consulting experience, primarily in specialty healthcare and the postacute segments of the healthcare industry. She is a graduate of Ball State University and is licensed as a registered nurse in Arizona, Arkansas, Colorado, Delaware, Idaho, Illinois, Iowa, Kansas, Kentucky, Maine, Maryland, Mississippi, Missouri, Nebraska, New Hampshire, New Mexico, North Carolina, North Dakota, Rhode Island, South Carolina, South Dakota, Tennessee, Texas, Utah, Virginia, and Wisconsin. Hislop’s client base spans all segments of the postacute and senior housing industry, including nursing homes/skilled nursing facilities, hospice, home health, CCRCs, assisted living, and senior housing.